Situated on a forested peninsula surrounded by coastal marshes, Wormsloe Plantation was established in 1737 by Noble Jones one of the first British colonists in the area. The site includes a plantation house built by Jones' grandson in 1828, a detached library, the ruins of a fortified house, a mile-long drive bordered by large oaks, and Confederate earthworks. 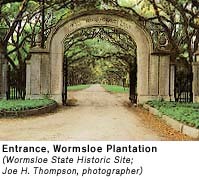 Wormsloe was Noble Jones' country estate where he experimented with his grand passion—horticulture. He protected the cypress and oak forests of his property and never cultivated the land. The surviving ruins of the original house are one of the only remaining examples of fortified houses once common throughout coastal Georgia. History--Noble Jones was a man on whom James Oglethorpe could depend. Jones, who had served as carpenter, constable and doctor to the colonists was also the man who laid out the city of Augusta, when Oglethorpe ordered him to do so in 1736. That same year Oglethorpe and the Trustees leased 500 acres to Jones, who began work on a combination plantation/fort along the Skidaway River, one of a myriad of Georgia's coastal rivers. Two other colonists, John Fallowfield and Henry Parker, joined Jones on this "Isle of Hope." Boats coming from the South Georgia coast and West Indies would frequently use the Skidaway as a shortcut to Savannah Georgia, putting Jones in an ideal spot to observe a potentially devastating "back-door" attack on Savannah. Work on a guardhouse, the initial structure at the site, began in 1739, after three years of clearing land, digging wells and trying to grow enough food to feed all the mouths on Wormsloe Plantation. On Septermber 29, 1740, approval was received to built a more suitable structure, made of tabby. About the time work on the home began, George Whitefield started Bethesda Orphan's Home, which is nearby. Building a fort in coastal Georgia was not an easy task. While land-based forts of wood held up well, a fort near water would have to withstand adverse conditions as well as Spanish cannon, so once approval was received, Jones built Wormsloe out of tabby, a mixture of limestone, sand and water with shells thrown in for good measure. The compound was a small enclosure, with a house built on the same spot where the current ruins are. The house actually shared a wall with the fort, probably to reduce the cost. It was 32' by 24', about twice the size of homes being built in Savannah Georgia at that time and similar in size to those being built in Frederica. Above the tabby walls of the structure, a wooden structure provided additional height to the home, probably to provide cover for soldiers returning fire to any attackers, although the wooden structure also had day-to-day uses, the most important being an air pocket to insulate the tabby dwelling. The rough-surfaced tabby would have been covered with plaster and painted with "whitewash." Within the compound was an outhouse and servants quarters were outside. In 1740, war with the Spanish (The War of Jenkins Ear) broke out and Jones spent much of his time fighting alongside General Oglethorpe. He organized a marine patrol, which used Wormsloe as headquarters. When hostilities came to an end following the Battle of Bloody Marsh in 1742, Jones returned home and began a career as both a businessman and horticulturist. When the Trustees relinquished control of the state Jones applied to the king for a grant of land including the 500 acres on Skidaway. The land was granted to him in 1756. In 1765 John and William Bartram described Wormsloe Plantation in detail on a journey to the Southeastern coast. One of Jones' sons, Noble Wimberly Jones, played a pivotal role in American Revolution. He led the Patriots in the General Assembly, twice elected as House leader and both times rejected by the royal governor. All this occurred while the elder Jones was on the royal governor's council. When Noble Jones died in 1775, his son did not inherit Wormsloe. In a will date June 17, 1767, Jones left the plantation to his daughter Mary. After the start of the war Jones served as a line officer, being captured in the fall of Charleston, SC. and serving time as a prisoner of war. In 1793, work began on a new tabby home at Wormsloe, the remains of which can be seen today. It is doubtful that Mary, sick and bedridden in Savannah Georgia, ever saw the home. She died in 1795, and Noble Wimberly Jones received the estate. Jones continued to play a role in Savannah city government until 1803, when he quit the council in disgust. In 1812 he returned to become mayor of the city. Lightly defended at the end of the Civil War Wormsloe, now owned by the DeRenne's (a Jones by marraige) fell into Union hands after a contingent of 176 troops were removed from Fort Wimberly on December 19, 1864. Two days later the city of Savannah Georgia fell. DeRenne worked hard to restore Georgia while working to improve the lives of former slaves, passing away in 1875. In a complex will he left Wormsloe to his wife so long as she did not remarry. Hours: Tuesday–Saturday 9 am –5 pm; Sunday 2–5:30 pm; Closed Monday (except holidays), Thanksgiving, Christmas and New Year’s Day. Admission Fees: $2.50-$4.Group rates available with advance notice. Directions: Located in the Isle of Hope, South of Savannah. Take I-16 to exit 164A (I-516 / W. F. Lynes Pkwy). Take I-516 to the end, where it becomes S.R. 21, then continue on to Skidaway Rd, a total of 6.6 miles. Turn right on Skidaway and continue for 2.8 miles to the entrance to Wormsloe on the right.